We create custom kitchens and bathrooms that are functional in design and impressive in style. At Kitchen Elements, we have been a locally owned family business since 2008, and our team has over 30 years’ experience in the industry – we take your kitchen and bath renovation dreams and turn them into reality. 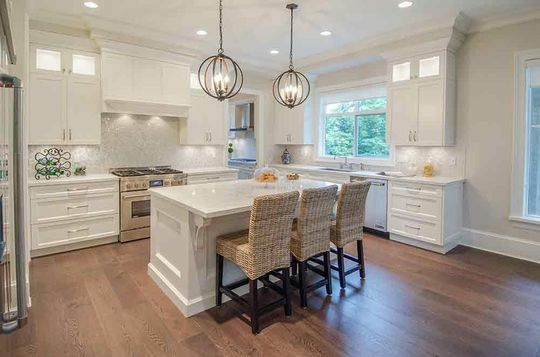 We specialize in kitchen and bathroom design, cabinetry, and the renovation process from start to finish for homeowners in Vancouver and the Lower Mainland. Our mission is to ensure your new kitchen or bathroom is completed on schedule and with the highest levels of quality in design and craftsmanship. We provide an extensive consultation process with computer-aided drawings to make sure you are confident with the end result. Give us a call to book a consultation or if you have any questions. From organizing the layout to creating the look and feel with our design software, we are able to guide you through the process and come up with a unique design for your kitchen or bathroom that you’re happy with. We work with you to determine the right style and function for the space you are looking to remodel. Contact us today to discuss your dream kitchen or bathroom and we can get started. Custom-designed cabinets, kitchens, and bathrooms to complete your home. Take a look at some of the spaces we’ve transformed with our custom designs. See what our clients have said about working with our team at Kitchen Elements. From our first meeting with Scott, through finaldesign decisions, and installation, the entire team at Kitchen Elements were friendly, professional and incredibly helpful. During installation, the team were considerate of our needs, even taking time to make sure our pets were comfortable and safe. Then, the day after installation, Scott was there to inspect cabinetry to make sure the final product met all our expectations. We're thrilled with our new kitchen! Thanks Scott! Belmont Homes Ltd exclusively uses and recommends to our customers, Kitchen Elements on every project. Their attention to detail and kitchen designs allows us to focus on the home renovation or new construction details, knowing the cabinet part of the job is looked after. - T. Craig – Belmont Homes Ltd.
From the initial meeting with Scott, initial planning permits everything was dealt with professionalism and Integrity. As this was not the easiest of reno's all went very well, from a complete plumbing, electrical redo a lot was involved as with dealing with some issues age of building etc. all came through exceptionally . Much Thanks to Scott and the Team. The Kitchen is Beautiful! !